I haven't shared much about my day-to-day professional career on this little blog, but things are about to get real personal. I kind of feel like the Wizard of Oz getting ready to step out from behind the curtain - haha! Well, I have worked for the American Cancer Society for just shy of 6 years and have LOVED my job. On a daily basis, you can find me helping cancer patients and caregivers power through their battles, working with social workers, coordinating and training volunteers, helping with large scale fundraising events, and generally working daily to put myself out of a job. The goal? Find that cure for cancer and end this awful disease for good. I've been passionate about fighting back against cancer ever since my mom was diagnosed in 2006. I started volunteering for St. Jude Children's Research Hospital which led to two internships in different cities across the U.S. Ever since then I knew I wanted to make a big impact not just through volunteering, but through what I do every single day. And that is when my health non-profit love affair began, and I've been doing it for more than 8 years now. Over the past year of volunteering for Ronald McDonald House Charities I began speaking with staff about a new opportunity as house director for their soon-to-be-opened Wylie House (I can't wait to show you photos after it opens next month!). After a long several month process of grueling interviews, I was shocked and elated when they offered me the job. I definitely didn't take my decision lightly, but with tons of prayer I blissfully accepted this awesome career move and took a huge leap of faith. Suddenly, I am leaving a job I have loved and co-workers that feel more like family. I'm leaving behind the familiar (and 30 glorious days of paid time off annually) and a job I know and do well for the complete unknown... and it equally thrills and scares the hell out of me. But I know in my heart this is the right move for me. Working with kids (which I love!) and families, being in a more creative space, having a schedule that will make waking up require two shots of espresso, but that will practically make me sing from the rooftops when I get off mid-afternoon so great. How very special it is when your co-workers are more like family, and your office more like home. I definitely don’t take that incredibly special dynamic lightly and I will miss you guys so very much. I definitely don't take it lightly that I've loved my job and the people around me so deeply. I know that's a rare and very valuable thing. Every day I came to work so inspired and I know it’s only because of my co-workers who so desperately want to end cancer forever. I am so proud of every dollar raised, every caregiver comforted, and every patient served so well over the past 5+ years I’ve been on staff. What they do every single day truly does make a HUGE difference in the lives of people in need during the very darkest hour. I know they are going to keep letting their light shine so brightly. I took this past week off in between jobs and I am so fortunate to have had time to soak in sleep, do little projects, knock errands off my list, go shopping for new work clothes, and just soak in the relaxing. And all the while over the past week, all I keep thinking is lucky me, lucky me, lucky me to have had something so special that inspires me to move on to something so great. 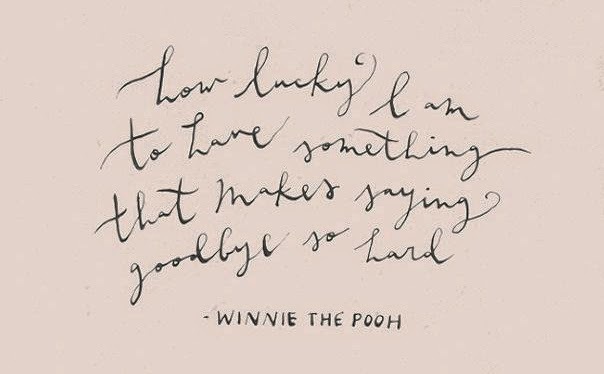 So send me some good luck vibes as I begin my new role at Ronald McDonald House Charities next week. I can't even wait to start this adventure and be inspired by some incredible families and kiddos along the way! Have you or a friend ever stayed at a Ronald McDonald House? I would LOVE to hear your inspirational stories! Oh my gosh! I'm excited for you, Meg! I wish you the best of luck and who knows? This new job might just be as endearing to you as the last one! Congrats! What an exciting opportunity for you. That is so exciting! One of the families in our small group at church has used RMH on several occasions. They have a daughter who was born outside the US and came to them with extensive health problems. Thanks to RMH they have been able to travel to some of the top children's hospitals in the country for her surgeries and treatments without the worry of how to pay for a place to stay and meals for weeks on end. It is a huge service to these families!! Best of luck to you!! Congratulations!! What an awesome and rewarding new opportunity! This is so exciting, Meg!!! CONGRATULATIONS!! It is so well deserved. 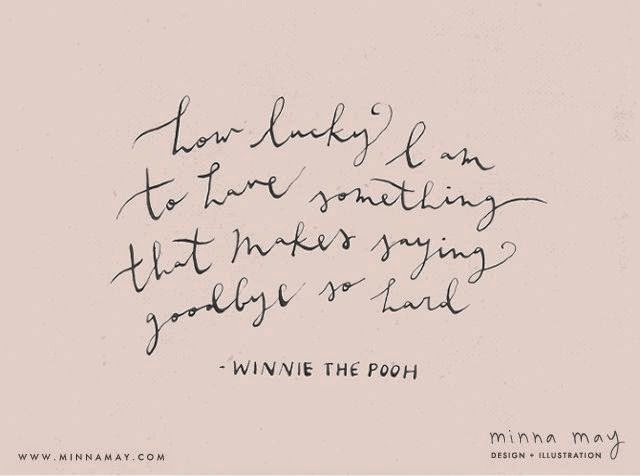 Winnie the Pooh really does say it best. 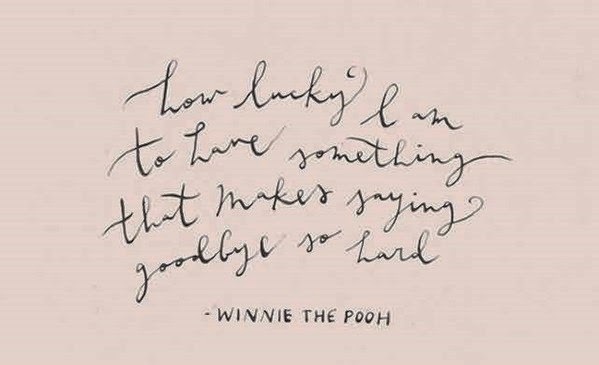 I find that pretty much all his quotes are spot on:) It is such a special thing to have been at a job you loved with people you love and then get to move to another job you feel so passionately about. It's really inspiring! I'm sure you'll do awesome next week! Congratulations, Meg! So excited for you! When my cousin's daughter was born, she was a crazy number of weeks early (I can't remember how many, but it was enough that her mom was helicoptered across the sound to Seattle to a larger hospital before birth). Anyway, because she was in the NICU for such a long time, my cousin and his wife stayed in a Ronald McDonald House for an extended period of time and it was amazing. So thankful for your new opportunity! Good luck! Good luck with the new job! How rewarding! You're amazing and I'm so excited for your new adventure!! That is so awesome! You're doing amazing work for people who truly need it. I hope one day to have a career that I feel just as passionate about. So exciting! I hope you are having a wonderful first day! !